Since 2005, we have had the privilege of carrying Pandora Jewelry… in fact, we were one of the first jewelry stores in the country to help build the brand! Over the last 13 years, we have provided expert sales advice (and had A LOT of fun!) designing charm bracelets and putting together stack rings for our clients. 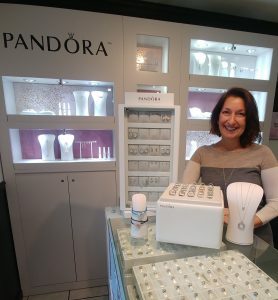 I have recently decided that Susan Bella Jewelry will not continue to sell Pandora Brand Products. We need to make room for all of the exciting new jewelry I’ve been buying at trade shows!! We’ve had an amazing run with Pandora, but now it’s time for us to focus on being able to provide more options for more price points with our Sterling Silver and Fine Jewelry. Perhaps you’ve seen our “Every Style, Every Budget“ campaign? Initially, this decision came with a very heavy heart. But now I am only excited — VERY excited — about the future of Susan Bella Jewelry and all of the fabulous new products I will be offering. This includes a new line of jewelry I’m designing (more to come on this! ), in addition to more custom one-of-a-kind pieces for sale! We are currently selling our beautiful Pandora collection Clearance Style: first come, first serve, while supplies last, all sales final. The current discount is 40% off and will increase closer to the Holiday, but your best selection is now, so don’t wait too long! Get your gifts now and hold them until December… did you know there are only 8 Saturdays left until Christmas, and even scarier, only 6 left before Hanukkah?? It’s been an honor to serve our clients with the Pandora line. Many of you found us because of the collection (thank you Googlers!) and during your visits learned of our unique silver and fine jewelry we showcase, as well as the other services we offer like expert repair, custom jewelry and even the simple watch battery change. There’s not much we don’t do… so THANK YOU for joining the Susan Bella family and making us your full service jeweler. As we approach our 10th anniversary, The Bella Team has much to look forward to, but most of all, serving you with all of your jewelry needs!